Astronomers from the California Institute of Technology (Caltech) and the University of Arizona have released the largest data set ever collected that documents the brightening and dimming of stars and other celestial objects — two hundred million in total. The night sky is filled with objects like asteroids that dash across the sky and others — like exploding stars and variable stars-that flash, dim, and brighten. Studying such phenomena can help astronomers better understand the evolution of stars, massive black holes in the centers of galaxies, and the structure of the Milky Way. These types of objects were also essential for the recent discovery of dark energy-the mysterious energy that dominates the expansion of the universe — which earned last year’s Nobel Prize. Using the Catalina Real-Time Transient Survey (CRTS), a project led by Caltech, the astronomers systematically scanned the heavens for these dynamic objects, producing an unprecedented data set that will allow scientists worldwide to pursue new research. The new data set is based on observations taken with the 0.7-meter telescope on Mt. Bigelow in Arizona. 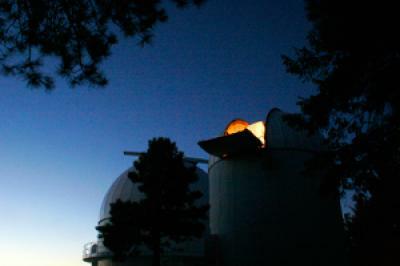 The observations were part of the Catalina Sky Survey (CSS), a search for Near-Earth Objects (NEOs) — asteroids that may pose a threat to Earth-conducted by astronomers at the University of Arizona. 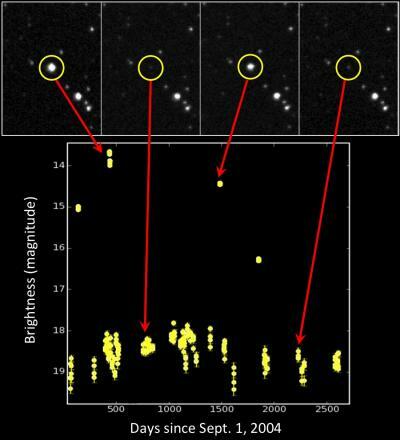 By repeatedly taking pictures of large swaths of the sky and comparing these images to previous ones, the CRTS is able to monitor the brightness of about half a billion objects, allowing it to search for those that dramatically brighten or dim. In this way, the CRTS team identified tens of thousands of variables, maximizing the science that can be gleaned from the original data. One of the unique features of the survey, Drake says, is that it emphasizes an open-data philosophy. “We discover transient events and publish them electronically in real time, so that anyone can follow them and make additional discoveries,” he explains. The data set includes over a thousand exploding stars called supernovae, including many unusual and novel types, as well as hundreds of so-called cataclysmic variables, which are pairs of stars in which one spills matter onto another, called a white dwarf; tens of thousands of other variable stars; and dwarf novae, which are binary stars that dramatically change in brightness. The team says they soon plan to release additional data taken with a 1.5-meter telescope on Mt. Lemmon in Arizona and a 0.5-meter telescope in Siding Spring in Australia. In addition to Djorgovski, Drake, and Beshore, the team includes staff scientist Ashish Mahabal, computational scientist Matthew Graham, postdoctoral scholar Ciro Donalek, and research scientist Roy Williams from Caltech. Researchers from other institutions include Steve Larson, Andrea Boattini, Alex Gibbs, Al Grauer, Rik Hill, and Richard Kowalski from the University of Arizona; Mauricio Catelan from Universidad Catholica in Chile; Eric Christensen from the Gemini Observatory in Hawaii; and Jose Prieto from Princeton University. The Caltech research is supported by the National Science Foundation. The work done at the University of Arizona is supported by NASA.